I had my one year 'Blogaversary' back in November and completely forgot to celebrate with some Blog Candy, so I decided it was about time! This past year has been absolutely amazing creatively speaking (personal, not so much lol). 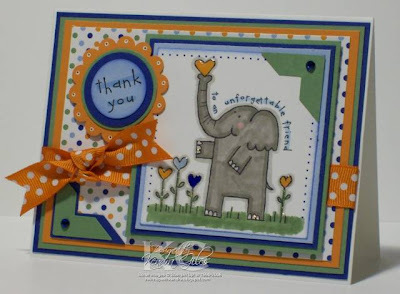 I have made so many wonderful lifelong stamping friends, joined some amazing design teams and grown in my stamping art beyond my wildest imagination. My blog took off and became something that I never imagined that it could be. I have had over 220k hits to my blog in the last 14 months. I truly am blessed to be in the company of so many amazing and talented people! I appreciate all of you who come and peek in on my blog daily and leave me so many sweet and flattering comments and also for those of you who email me with questions that I am more than happy to answer. All you need to do to win this wonderful blog candy is leave a comment on this post! 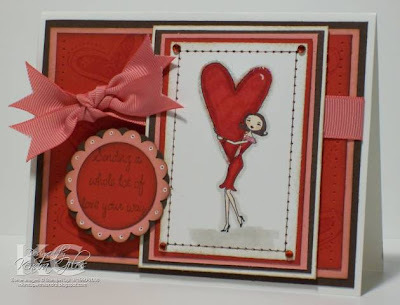 Up for grabs is the new set from Hanna Stamps - Celebration, My Favorite Things Mini of the Month - Be Mine, Opal Liquid Pearls, 5/8" Chocolate and Red Grosgrain Ribbon and a handmade card using Hanna's Domestic Goddess stampset. I will pick a winner randomly on Sunday evening. Good Luck! 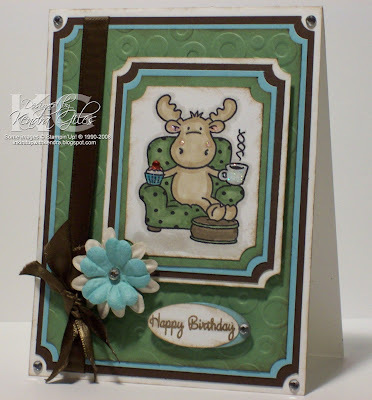 ETA** The Moose Are On the Loose over at Hanna Stamps! Kristi has released the newest stamps early - you can get yours here! Here is a peek at my niece's baby shower invitations that I promised I would show you last week. 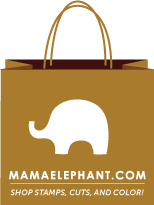 Her theme is jungle animals, so I thought the adorable elephant from MFT's 'It's a Jungle out There' would be perfect! And of course I had to color him blue. Kelsey is having a boy and her mom and I are sooooo excited and can't wait for Brayden to be here! Check back tomorrow I will be posting my Blog Candy! Accessories: Scallop Circle Punch, Circle Punch, Brads, Copic Markers, Stickles, Corner Rounder, White Gel Pen, Word Window Punch, Grosgrain Ribbon, Dimensionals. So I was sitting at my stamp table last night and was staring at my gobs and gobs of SU! stampsets and thought I should grab one of my "oldies" and get some ink on it.............I decided to use Living Large. I remember back when I first saw this set, I HAD to have it!! I haven't used it in so long, but I still adore it and won't part with it. Who can resist Regal Rose, Real Red and Chocolate Chip paired together? Well, apparently not me - I want to reach for it everytime I do a Valentine card! The background is stamped with the heart from Priceless. 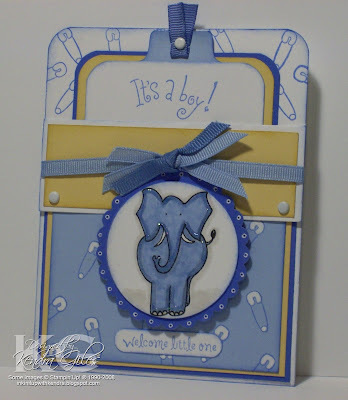 I went crazy with my paper piercer on this card........I was doing faux eyelets and faux stitching like a mad woman - baahaha! I made several of this particular card for you guessed it, a card order. I will be back tomorrow with a glimpse of one of the Baby Shower Invites I have been working on. Stamps: Living Large and Priceless from SU! Accessories: Paper Piercer, Dimensionals, Gemstones, Scallop Circle Punch, Circle Punch, Copic Markers, SU! Markers, Stickles, 5/8" Grosgrain Ribbon. Domestic Goddess - Hanna Sneak Peek! Isn't Hanna the Domestic Goddess, just the cutest thing ever?!!! The minute I saw this set, I knew it would be a winner! I had such a blast coloring her! Isn't she gorgeous with her bling while she is cleaning?! She will make her debut on February 1 at Hanna Stamps. 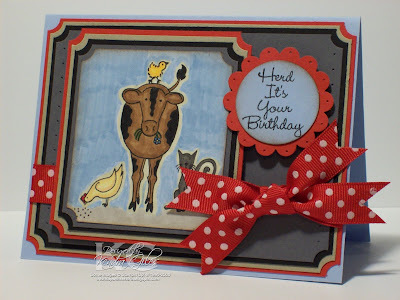 This Friday, Jan 25th is Kristi's Birthday (owner of Hanna Stamps), so to help celebrate it,we are having a birthday party on the Hanna SCS Forum from 8-11 EST. We are going have a ton of fun. 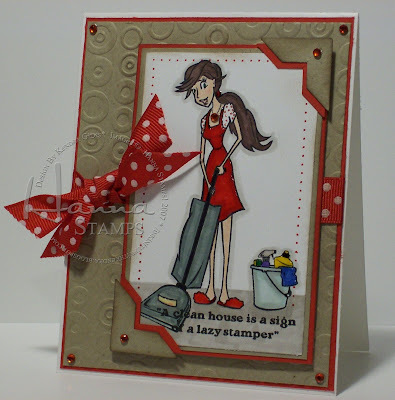 Kristi will be giving away never before released sets, Riley Moose, Domestic Goddess and other Hanna Stamps. Accessories: Photo Corner Punch, Gemstones, Copic Markers, SU! Markers, Crystal Effects, Cuttlebug, Dimensionals, 5/8" Polkadot Grosgrain Ribbon. I hope you all had a fabulous weekend - I sure did. Robyn and I got together again this weekend to do some stamping/scrapbooking...........well I stamped and she worked on her scrapbook. I used to be a huge scrapbooker, but when I found stamping that sort of took a backseat. I love the instant gratification I get from my stamping - it takes me forevah to get a scrapbook page completed. 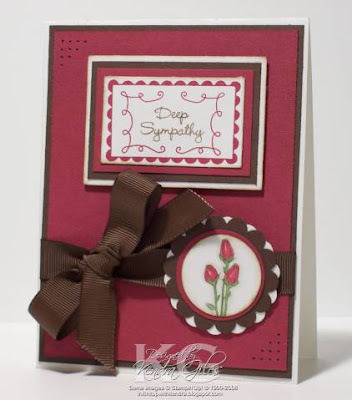 This is one of the cards that I worked on while I was at Robyn's. I just got my pack of SU! Jersey Shore DP on Friday (it's delish!) 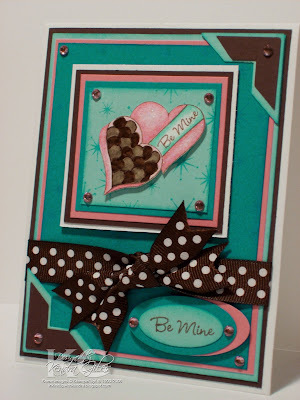 and decided that I wanted to make a card using the Happy Heart Day set, but didn't want to make a valentine card. This card just goes to show you that you can use this set for anything, not just valentine cards. I absolutely LOVE this color combo........and I always forget about pumpkin pie......it's such a yummy color! I also got started on the baby shower invites for my niece, Kelsey. They are gonna be just adorable! I will post a peek at those soon! I hope you all have a Happy Monday! Accessories: Scallop Circle Punch, Circle Punches, Photo Corner Punch, Dimensionals, Copic Markers, SU! Markers, Gemstones, Paper Piercer, White Gel Pen, Polkadot Grosgrain Ribbon, Crystal Effects. A Sneak Peek and Some Good News! Say hello to Riley Moose!! He is the newest line of stamps from Hanna Stamps. Riley will make his debut on February 1. Isn't he just too cute?! Riley is in his comfy chair holding a cupcake just for you! I had such a great time coloring Riley with my copics - I added a little stickles to the cupcake, his cheeks and of course his cup of cocoa! The Riley Moose stamps are mounted red rubber and they are of fantastic quality - the image stamps crisp and clean. The sentiment is from Things Hanna Would Say. I have so much work to do this week and several card orders to get completed. I'll be back to share more goodies! 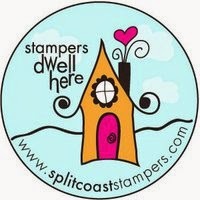 ETA** Hanna Stamps is one of the newest Member Companies over on SCS, as of today! You can chat, play games, participate in sketches, and a ton of other fun stuff! It might take a little bit for them to get it all set up and running live, but you can check it out here. Accessories: Gemstones, Copic Markers, Cuttlebug, Ticket Corner Punch, Oval Punch, Primas, Dimensionals, Stickles. Happy Friday & Happy Cupcake Day! It's finally Friday and I am so ready for the weekend. It has been a really long week - I was just getting used to a few days off here and there during the holidays - having to work a full week just stinks! I don't really have anything planned for this weekend except getting some stamping done. My good friend Robyn is coming over tonight so we can stamp - she and I haven't done that in a long time so I am looking forward to it. I made this card to go with an assorted birthday card order that I received a few days ago. 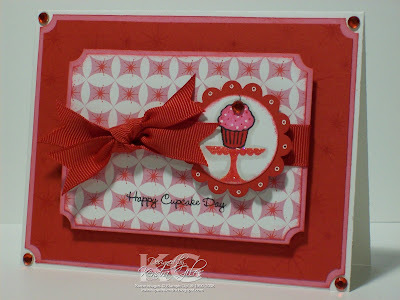 I decided to use Icing on the Cake from MFT for this particular card. I just love the cupcake and the cake plate from this set! The background is stamped with the "starburst" from the set and the DP is the new digital paper from My Favorite Things - I love this stuff! You can print as much as you want and the quality is just amazing. I used the faux eyelet technique on the scalloped circle punch - just use your paper piercer to pierce the hole, then use your gel pen to go around the hole - this technique is sooooo easy and supah cute. Yesterday my stamps from Lizzie Anne Designs arrived - High Hellos. This set is just way too cute. I absolutely love this topiary tree!!! I received an order for a set of 6 thank you cards and I decided this topiary would be perfect to use. I had so much fun coloring the topiary with my copics! Tomorrow will start the first sneak peeks for the new stamp releases from My Favorite Things. 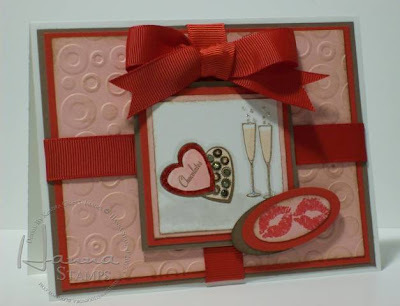 You are gonna absolutely love these new stamp sets, they are just TDF! Check back tomorrow afternoon, I will be posting my sneak peek! Accessories: Cuttlebug, Copic Markers, Oval Punches, Dimensionals, Stickles, Ticket Corner Punch. I have been wanting to try to make a "ribbon blossom" - my good friend Pam Bassett is the creator of these amazing bows. Mine doesn't hold a candle to hers, but I think it turned out okay. 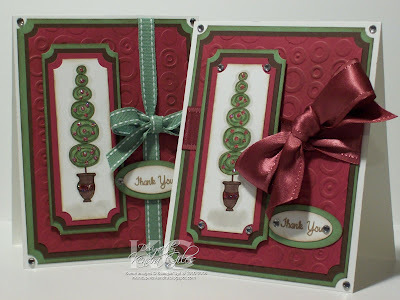 She has a great tutorial on her blog that shows you how she makes her ribbon blossoms - you have to check it out!! 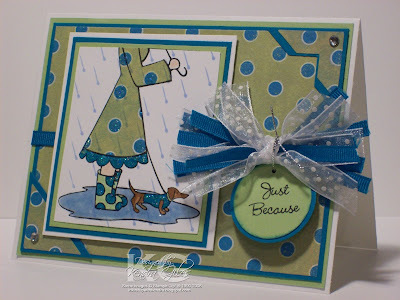 I used Rain or Shine by MFT to make this card.......my Tres Jolie DP was the perfect match and thought it would look great with her polka dot rainboots. Paper piecing is so much fun! I added stickles to her dress and her rainboots and of course the little weenie dog's shirt - very sparkly! I also used Crystal Effects on the rain puddle. I received a few more card orders yesterday so I better get busy. Have a great weekend! Accessories: Photo Corner Punch, Circle Punches, Ribbon, Gemstones, Stickles, Crystal Effects.